Having some ‘normal’ healthy food between Christmas and New Year is something I always crave but, given the manic few days I’ve usually had, I can never be bothered to faff around too much. That’s why this recipe is a perfect one to whack out in the post Christmas/ pre New Year period. 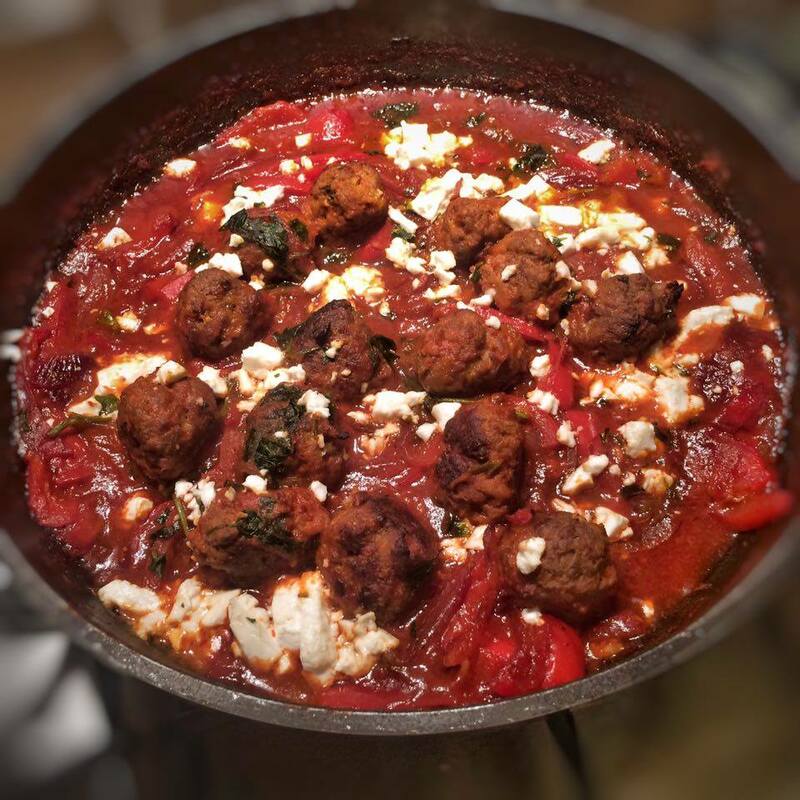 The meatballs themselves are the exact same meatballs I used in my Lamb Kofta Meatball Kebab recipe so if you made this and made extras, this one will be nice and easy to whip up! If you don’t have them pre made or can’t be bothered to rustle them up from scratch, feel free to use any pre made meatballs that you might get in the supermarket. In a large bowl add all of the meatball ingredients. Mix until well combined and then using either your hands or, if you have one, a meatball press (I got mine from eBay and it was really good value! ), form the mixture into golf ball sized meatballs, rolling in your palms until nicely shaped. At this point if you have followed the recipe above you will have 36 meatballs. If only making for two, separate 12 meatballs from the rest for this meal and pop into a food bag in the freezer for another meal. Then take a large frying pan, spray with 1kal and on a medium heat, fry the 12 meatballs until browned on the outsides. Remove from the pan and pop onto a plate. In the same pan, add the onion, peppers, garlic, cumin and coriander and fry for a few minutes. Add the tomato puree and harissa paste, fry for 1 minute and then add half the stock (add the saffron to the stock if using). Stir and simmer the mixture for a few minutes until it starts to thicken. Add 100ml more of the stock, simmer until a little thicker again. Add the meatballs back to the pan, add the last of the stock, stir and then pop in the oven for 15 minutes. Cook the rice or cous cous whilst the meatballs are in the oven. After 15 minutes, scatter the feta on top of the meatballs and sauce and pop in the oven for another five minutes until it has melted a little. After five minutes remove from the oven, scatter with parsley and coriander and squeeze over the juice of ½ lemon. Serve the meatballs and sauce on top of the rice or cous cous with a slice of lemon per person. Hi Laura, I’m a weight watchers member and regularly use your website for recipes . 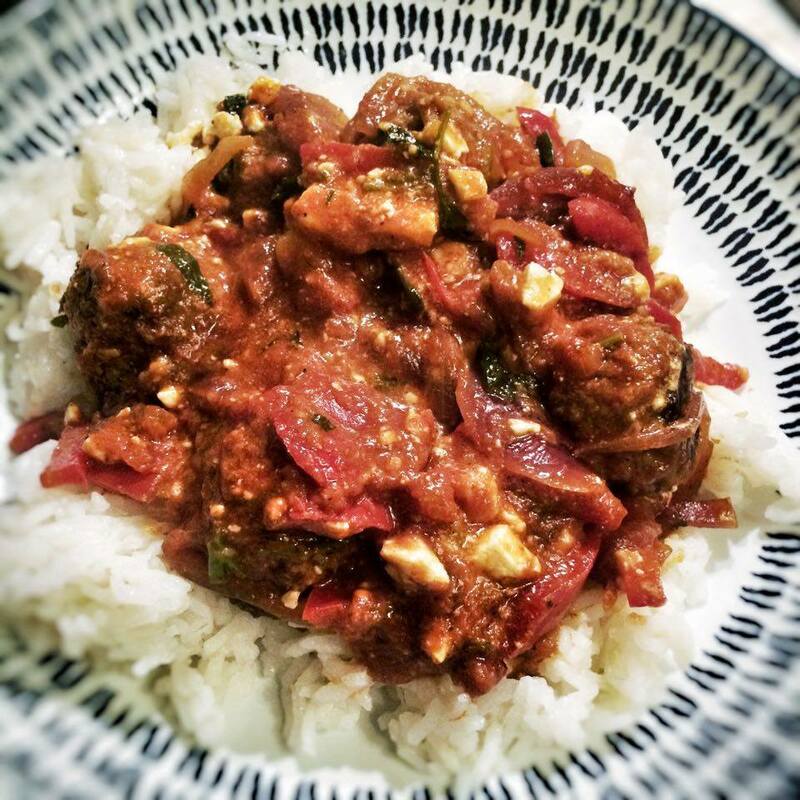 I made the Moroccan meatballs last night but am a bit confused about the sauce; the recipe says it serves 2 but the meatballs serve 6; does the sauce serve 2 or 6 because the recipe mentions leaving all the meatballs in the sauce? Also when it asks for 2tsp coriander and cumin does that mean 2tsp combined or 2 of each? Great, thank you. That’s what I hoped as I split the sauce between two.